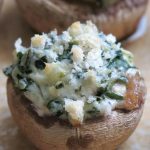 Easy Stuffed Mushrooms with Spinach and Cream Cheese take minutes to prepare and use ingredients you probably have on hand! Unusual ingredients? These call for staples, like cream cheese and frozen spinach. Too much work? There’s no stove-top cooking involved. Just mix, fill and bake. They are topped with a very light sprinkling of panko breadcrumbs. But, this ingredient is completely optional and should be left-off for gluten-free diets. 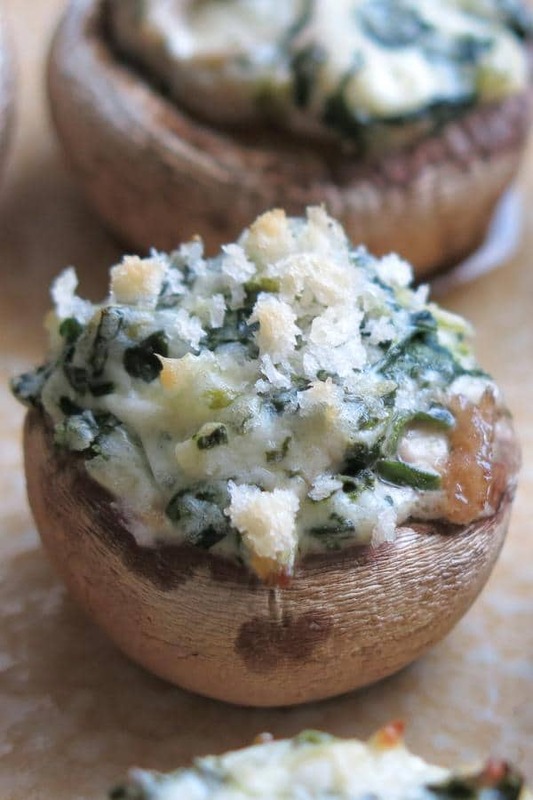 I can’t think of a better appetizer than simple stuffed mushrooms. Once you’ve made this recipe, check out Pizza Stuffed Mushrooms and Guacamole Stuffed Mushrooms. Before you know it, you’ll be part of the “I Heart Mushrooms” club! The short answer is: pop out the stems, wipe the mushrooms clean, mix the filling ingredients, stuff the mushrooms and bake. Each step is discussed below. Pop out the stem of the mushroom from the cap. It will just pop right out when you pull it to the side. Some recipes call for you to chop up the stem and use it in the stuffing. But, then you would need to soften it on the stove-top. There’s no time for that because this is a quick and easy recipe! So, discard the stem or use it for another purpose. It would be great in mushroom stock. White or baby bella mushrooms work perfectly in this recipe. As for the cream cheese stuffing, this mixture requires no cooking at all (once again…these are easy stuffed mushrooms.) I combined whipped cream cheese, Parmesan cheese, Seasoning Salt and chopped spinach. I used whipped cream cheese because it’s easy to mix. However, you can use any cream cheese, including a vegan option, just soften it first. I always have a bottle of Jane’s Krazy Mixed-Up Salt around. It’s a blend of spices that never seems to disappoint. Instead of reaching for several different spices, I only needed to reach for one. Garlic salt or other seasoning salt should work just fine in this recipe too. And, then there is the spinach. I love spinach and the color it adds to the mixture. It’s a healthy addition. Just lift a small chunk from a bag you have in the freezer. Lift some out the night before. Otherwise, defrost it in the microwave for about 30 seconds. Press the water out with a paper towel. I had a batch without any spinach at all and it was delicious too. I guess I’m a sucker for cream cheese and mushrooms. Top each mushroom with a light sprinkling of Panko breadcrumbs if desired. It’s not absolutely necessary, but the slight crunchiness is nice. 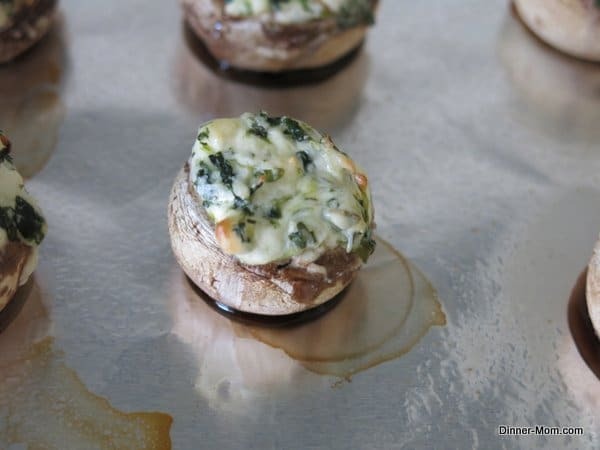 Say you’re planning to double or triple this easy stuffed mushrooms recipe for a party or you don’t have 5 minutes to prepare the cream cheese mixture…you can make up the filling ahead of time and store it in the refrigerator. Pop out the stems of the mushroom too. But, don’t clean or fill the mushrooms more than an hour or two ahead of time. 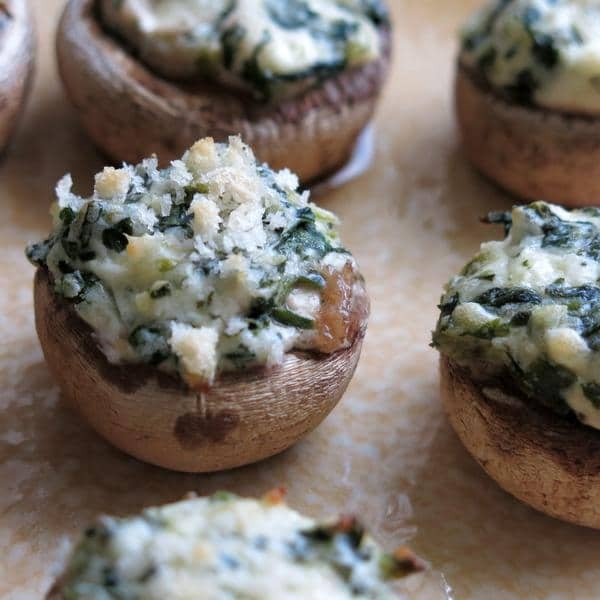 Change up the cream cheese mixture in these easy stuffed mushrooms depending upon what you have in the fridge. A little extra crab or shrimp? Bacon? Fresh herbs? The variations are endless! 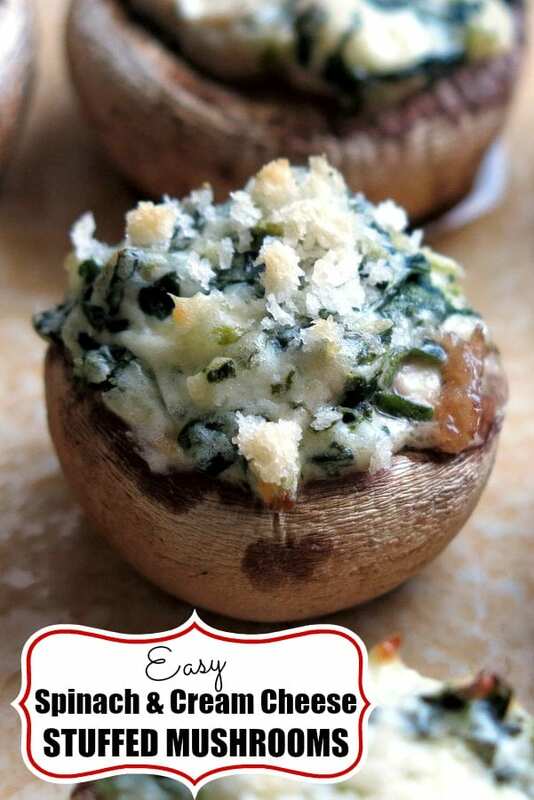 Tag @DinnerMom or #DinnerMom on social media if you make this simple stuffed mushroom recipe. We love to see what you are cooking! We’ve included Amazon links to products we used to make this recipe. If you click on a link and buy something we will receive a small commission that supports the operation of this blog. Thanks for shopping! 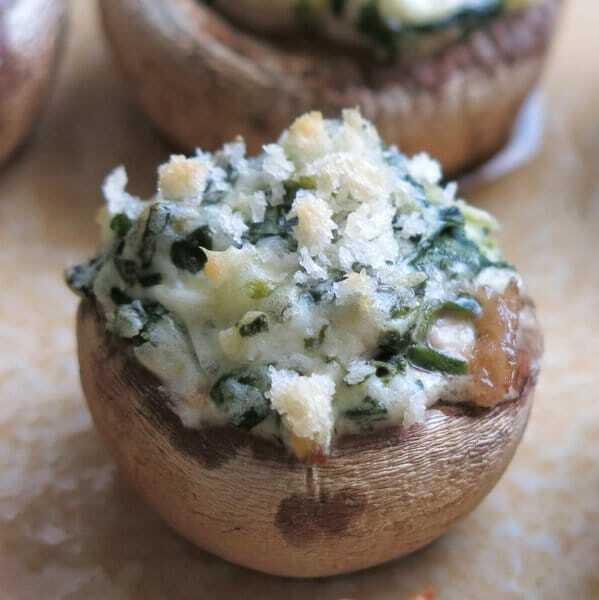 Make these easy stuffed mushrooms with cream cheese and spinach in under 30 minutes. A low-carb appetizer or snack. Pop out the stem of the mushroom, leaving the cap. Reserve stems for another use or discard. 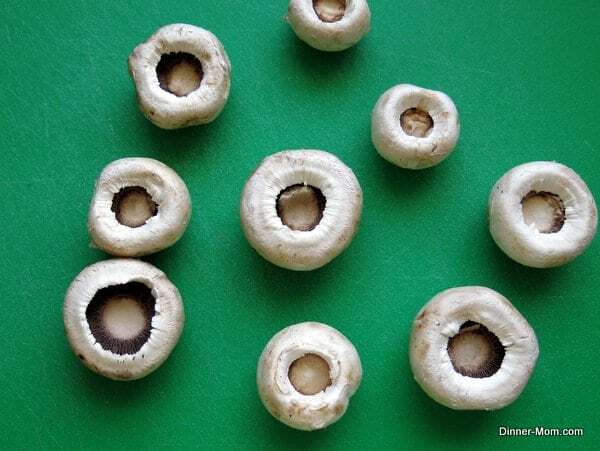 Brush off any dirt on the mushrooms with a damp paper towel. 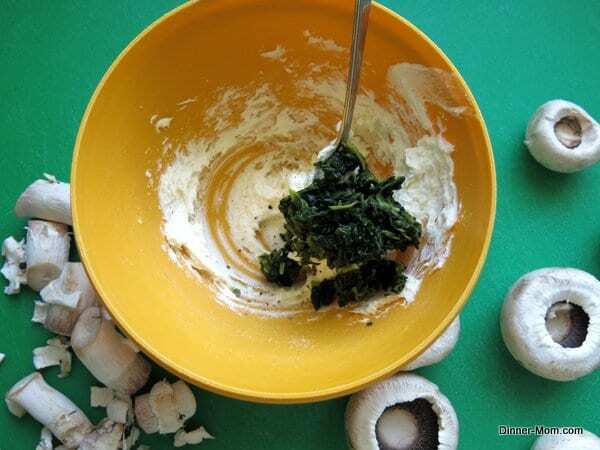 Mix cream cheese, Parmesan cheese, salt and chopped spinach in a bowl. Fill the opening in each mushroom with the cream cheese mixture. Lightly sprinkle Panko breadcrumbs on top of the cream cheese mixture, if using. Place mushrooms on a baking sheet coated with cooking spray. Bake for about 15 minutes. Juices will begin to pool at the bottom of the mushrooms and the top will begin to lightly brown. The serving size will vary based upon the size of the mushrooms in the package purchased. Double or triple quantities for more servings. Cream cheese mixture can be made ahead of time. These really are the best little snacks! A mouthwatering healthy treat that always seems to be inhaled. Thanks for sharing your recipe, I also love topping my stuffed caps with Panko! Baking these little yummies later to go with the mushroom-leek quiche! That sounds like quite a duo…wish I could come over for dinner! Can you make the stuffing a couple days in advance so on the day you just put it into the mushrooms and heat it up in the oven? Easy to make -yes. But they lacked seasoning and anything distinctive. I added sharp cheddar, parm and muenster, along with a dash of Worcestershire, and they were still rather dull. Sorry…not a fan. I’m so sorry you did not enjoy them. Would it be possible to stuff & freeze these. Then bake when needed? Hi! Unfortunately, I don’t think this will work. Instead, you might want to make up the filling and store in the refrigerator until you are ready to cook the mushrooms.